The Triple 7’s Blackjack game offers you something that no other standard or regional variant of online black games do and that is when playing this game online you could win a huge sized progressive jackpot when playing it. The game is one on which you are obliged to place a side bet wage alongside each of your base game bets and as such keep that fact in mind if you do decide to play it online. The game is one which uses a shoe of playing card that contains 5 decks of playing card and being an online blackjack game those decks are fully shuffled before you are dealt out your initial hand. In regards to how the dealer will play off each and every initial two card hand he has dealt out to himself, he is going to always stand his hands when they are worth 17 or higher in value and hit all hands which are worth 16 or lower in value. You are going to find that when you play the Triple 7’s Blackjack game online you are forced to make an additional side bet wager of 1.00 which will of course be in the currency you selected when opening up your account. The base game wagers can be played for stake of as low as 1.00 or as high as 200.00 per hand played. The standard winning payouts are 2 to 1 for a winning insurance bet, even money for all other winning player hands and if you get a blackjack hand that will be paid out at odds of 3 to 2. The side bet will qualify you to receive a range of bonus payouts which are based on your initial two or three card hand. Those bonus payouts include you having the chance of winning a progressive jackpot the value of which is displayed at the top of the screen and to receive that progressive jackpot payout you have to get dealt out three 7’s in the suite of Diamonds. The other bonus payouts are awarded when you get any two or three 7 valued cards dealt out to you as your initial two or three card hand. If you play the Triple 7’s Deck Blackjack game optimally the lowest house edge that you will be playing against works out at 0.59%, so do keep on reading to learn how to play this game optimally and strategically. That house edge does not take into account the side bet option, so keep that in mind. As the Triple 7’s blackjack game is not a hole card game then you will never see the dealer taking a quick look at his down facing card, for at the initial stage of the game when he deals out all of the card he only deals himself one single up facing card and will play his hand off when you have completed playing yours off. You will be able to double down your initial two card hand but only if it has a value of a hard 9, 10 or 11, be aware though that if you do wish to double down on any such hand than a second wager will need to be place onto the blackjack betting box in front to you and that wager is going to be the same amount you wagered on the base game hand you placed that got that game underway. If you do decide to play this game online then be aware that you cannot double down your hand if you have split that hand and you can hit a pair of split aces multiple times. To be able to play Triple 7’s Blackjack and reduce the house edge down to the lowest possible house edge you should make use of our blackjack strategy card for this variant, as every possible hand you can be dealt out is displayed on that card along with the correct playing move based on what card you can see the dealer displaying. However, below are some easy to remember playing moves that will always see you playing this variant optimally. Surrender – At no point in time when you are playing Triple 7 Blackjack online are you going to be offered either a late or early surrender option. Doubling Down – The most strategic time of you to double down a hand when playing this blackjack game is when you initial two cards are worth a hard 9 and the dealers up card is a 2 to 6 valued hand. Hitting a Hand – If you have been dealt out a hard 12 valued hand then you should hit that hand if the dealers is showing a card worth 2, 3 in value or any card worth from a 7 to ace, all other cards shown by the dealer namely a 4, 5 or 6 when you have a had 12 should call of you to stand those hands instead of hitting them. When to Stand – If you are dealt out any pair of cards which both have a value of 10 then you are going to be playing this blackjack game strategically if you stand those hands. Many players will choose to split a pair of ten valued hands but that is the incorrect way of playing off those games, so make sure that you always stand any pair of 10 valued cards as that is the correct playing strategy. 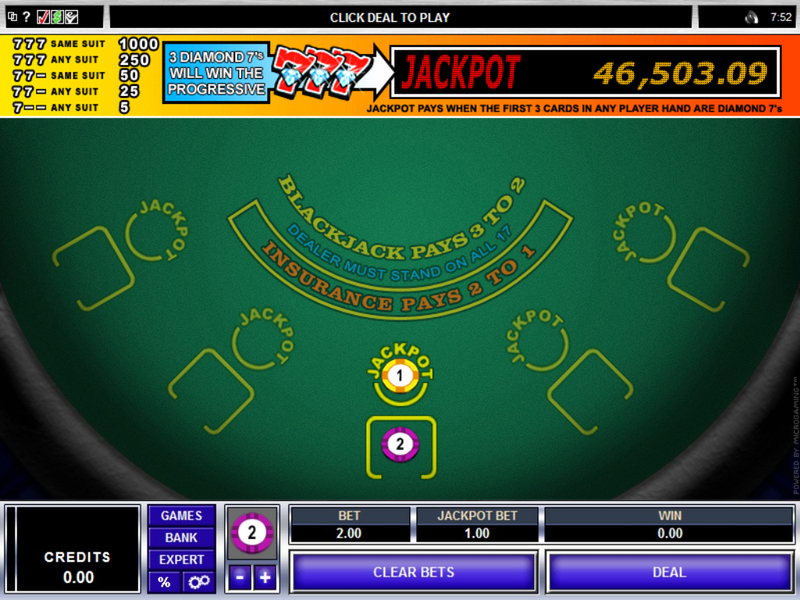 Insurance – There is a bonus side bet which you are going to be invited to place from time to time when playing he Triple 7’s Blackjack game online and that is the insurance side bet option. This bet is a wager on which you will be hoping to dealers hand is a blackjack hand when you have taken the bet and placed it and if it is a winning payout of 2 to 1 is awarded to you based on the side bet wagered amount which must be half of your base game staked amount. However, that bet offers no value and does come with a huge house edge so never take it when offered to you and over time it will increase the house edge of this game quite noticeably. 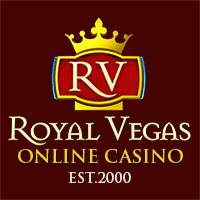 You are rarely going to find any online casinos that will allow you to use any bonus offers they have available to their players on the Triple 7’s Blackjack game due to the live progressive jackpot that can be won when playing it, so do double check but reading through the terms and conditions of any bonus if you are thinking about playing this game with bonus credits. One thing you will be awarded with when playing the Triple 7’s Blackjack game to in fact any other real money online blackjack game are comp and loyalty points. The number of points awarded will vary based on where you are playing as will the redemption rates for swapping your points into playing credits, so be prepared to compare just hat any online casinos you play at in regards to how generous their loyalty schemes are and play at a casino offering a true valued loyalty club.